Hey good lookin', whatcha got bookin'? 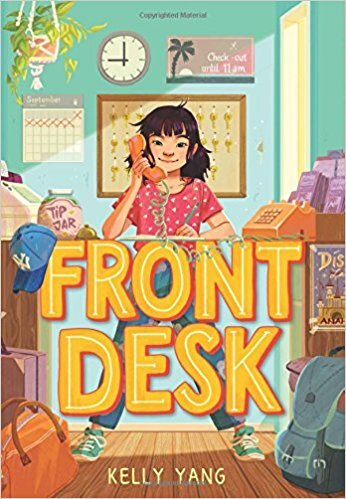 Last month, we shared a list of the best books of 2018 — and basically my To-Read list grew from “out of control” to “SUPER DUPER out of control.” So I decided to start the new year properly by tackling that list, starting with Front Desk by Kelly Yang. And I am SUPER DUPER glad that I chose that book because it was SUPER DUPER amazing! Front Desk is about Mia, who lives with her parents at a motel. But they’re not guests; they work there. Mia’s parents manage the place, spending most of their time cleaning rooms and doing laundry — so when she’s not at school, Mia runs the front desk! It sounds like a cool gig, but unfortunately the motel owner is a bit of a jerk. Actually, he’s a SUPER DUPER jerk. He refuses to pay Mia’s parents a fair wage even while demanding they work until they’re absolutely exhausted, he’s rude to the regular guests who essentially live at the motel, and he doesn’t even care about Mia’s family’s safety. And that’s not even all the drama that Mia has to deal with! So, as you can see, Mia’s dealing with a lot — not only is her family struggling, but she’s also learning more about the challenges faced by other immigrants and she’s witnessing the effects of racism firsthand. But don’t worry, Front Desk isn’t a dark and gloomy read. There are definitely sad parts (I cried), but there are also lots of happy parts (I cried). And I loved the character of Mia, who is full of energy and really relatable. That was my favorite part of the book — getting to know Mia and seeing things through her eyes. My childhood was completely different from Mia’s, and I had the luxury of never having to think about the kinds of difficulties that Mia and her family encounter. Front Desk is a moving and much-needed window into their experiences. I’d recommend Front Desk to, well, everyone! But I think you’ll especially enjoy it if you’re a fan of realistic fiction about families, such as The Epic Fail of Arturo Zamora by Pablo Cartaya and Saving Kabul Corner by N.H. Senzai (both of which also involve family businesses!). Is there another similar book that you would recommend? Leave a comment with your suggestion! Karen wouldn’t have been able to run the front desk of a motel when she was Mia’s age. She was SUPER DUPER bad at talking with adults. Actually, maybe that’s why she still prefers talking with young people through Kidsmomo! Kidsmomo believes a bookshelf should only be bare when someone's reading what was on it, so we're all about introducing kids to books and series they'll love! Do you love or hate book? Perhaps just a little crush or that lukewarm "just friends" feeling? Send in your review and share with the world!